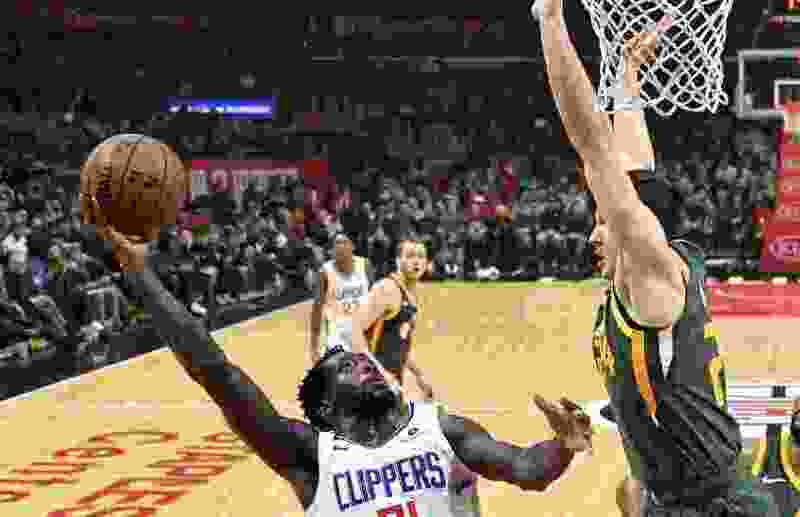 Three thoughts on the Utah Jazz’s 129-109 win over the L.A. Clippers from Salt Lake Tribune beat writer Andy Larsen. 129 points in 104 possessions is quite the offensive accomplishment for the Jazz, especially given their injury situation. And it’s not as if the Jazz shot the ball in an outlier fashion: they shot just 11-33 from the 3-point line, which is just fine, not excellent. Nor is it like the Jazz were getting out in transition and scoring: the Jazz only scored five fast-break points. But the Jazz took advantage of an aggressive Clippers defense through their ball movement. The Clippers brought so much defensive pressure on Donovan Mitchell and Joe Ingles, essentially trapping them in pick and roll, and the Jazz’s primary ballhandlers were able to pass out of those situations and find open men for 4-on-3 — at best — situations. Sometimes it took just one pass to find the open man. Take these plays: Ingles pick and roll which he either lobs over the top or bounce passes for a layup. Or, alternatively, Mitchell finding the open perimeter player, in this case, Jae Crowder, for the open drive to the rim. This happened frequently. Sometimes it took two passes. Here, Ingles starts to run a pick and roll, but he doesn’t like the first read. So he runs it again, and this time, Gobert is able to get the step on Tobias Harris. From there, the defense has to help, and Derrick Favors has a path at a dunk. Easy peasy. It never took three passes. The Clippers aren’t a good defensive team, they were 23rd in the league coming into Wednesday, let alone after it. But this kind of defensive style against the Jazz is death, even for a team like Oklahoma City that is long and active. The Jazz are too good at passing and reading out of these situations, and they’ll just cut you up for too many easy points. After being a focus of Monday’s Triple Team thanks to a awful shooting slump, Jae Crowder was a huge part of the Jazz’s win on Wednesday, finishing with a game-high +30 to go along with 23 points on 8-15 shooting. I didn’t think the kinds of shots Crowder took were too different than what he had done in games past were any different than his usual standard, they just went in. Obviously, when they do, it’s a huge boon to the Jazz. But regardless of whether or not the shots go in, I do want to credit his defense. His level of defensive activity is really impressive, and he’s able to benefit frequently when ballhandlers stop their dribble. This play is nice. It’s a classic pick-and-roll situation, and Crowder does a good job of staying in a really good spot: he’s right in the middle of being able to help close out on the shooter in the corner if that’s the pass that’s made, or help stop the lob — which is what happens. He also can help way out on the perimeter too, getting deflections beyond the 3-point line in pick-and-roll defensive situations like this. It’s just really good versatility. He doesn’t have the vertical leap or length to be a rim protector by any means, but he’s aggressive enough and pretty good at reading defensive situations. Gobert’s obviously the key part of the Jazz’s defense, and this section isn’t about him only because I’ve written about him so much. But Crowder does help on that end in a big way. Man, the Jazz have gotten so good at defending without fouling. Tonight, the Jazz allowed just a 9.2 free-throw rate from the Clippers, excluding garbage time, one of the best performances by a team this season. And it’s their eighth-straight game where they allowed a below-average number of free-throws from the team they were defending. They do this by showing their hands to the officials on opposing drives, making aggressively clear that they’re in a legal guarding position. Look at Kyle Korver here: as Gallinari initiates the contact, Korver has his hands up, really almost behind his head to indicated that he’s not doing anything illegal defensively. Defending without fouling also puts the Jazz in a position where Gobert can make an impact. The guards have a tricky job: they can’t let players have a free run to the rim to beat Gobert, otherwise it’s probably asking him to do too much. But fouling drivers means that Gobert is essentially taken out of the play. Tonight, it was the thing that the Jazz did best defensively. The Clippers average the most free throws in the NBA, with 23 per game. Against the Jazz, they only made nine.